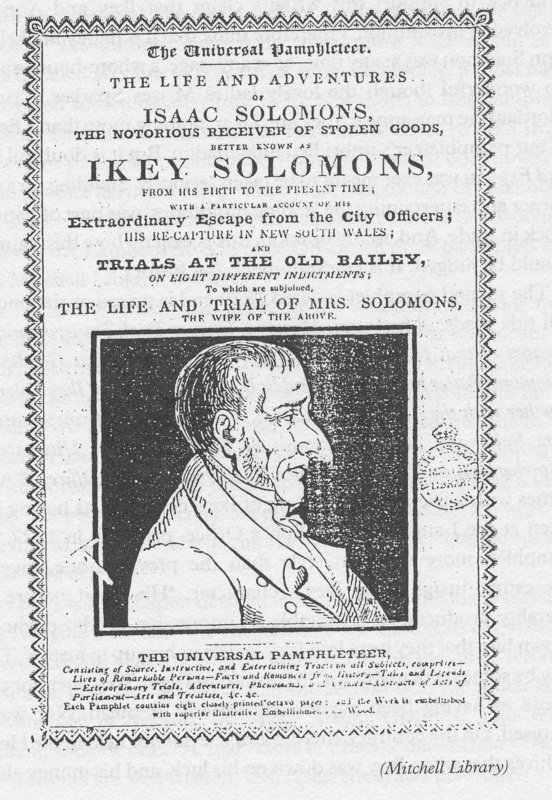 Pamphlet detailing the life of "The Great Ikey Solomons"
PRINCE OF FENCES is set is various locations in London, England, New York City, and Hobart Town, Van Dieman’s Land, Tasmania from 1827-1831, and follows the story of Isaac (Ikey) Solomon, the notorious London receiver upon whom Charles Dickens based his villainous fence, Moses Fagin. The play begins in London, 1827. Ikey is at the top of his game and presides over a group of thieves who bring stolen goods to his jewelry shop on Bell Lane for inspection and hopeful purchase. Together they sing, “THE PRINCE OF FENCES,” which explains Ikey’s position and rules of the game. Among the thieves is a young John Solomon, Ikey’s son, who aspires to be like his father. Ikey tutors him in the song, “YOU WILL BE LIKE ME.” Against his better judgment, Ikey allows John to attend a rally at Westminster Hall that evening, and to steal what he can, but to be very careful, as “there will be as many Bobbies as baubles.” Ikey tells John to meet him at the Red Lion Pub later, then retires to his home for dinner with his wife, Hannah, and his younger children. Ikey, at home with his wife after dinner, rises to meet John at the Red Lion Pub, a favorite hangout of Petticoat Lane’s most disreputable characters. His wife, distressed by Ikey’s constant leaving, begs him to stay and they sing “I PROMISE,” which tells of their love and Hannah’s desire for a normal home life with her husband. Ikey quells her worry, promises to return, and leaves for the pub. In the pub, the thieves and whores, frustrated by their fate in London and the threat of transportation to the new penal colonies in Australia sing “LET’S GO THERE TODAY” about a dreamland where they are respected and life is good. Ikey joins in. Their reverie is interrupted by John, who rushes into the pub, chased by two Bobbies. Ikey takes the bag of stolen goods from him and John hides. The Bobbies enter, find the goods on Ikey and arrest him. John, ashamed of his cowardice that resulted in Ikey’s arrest, asks forgiveness from Hannah in the song “RIGHT THE WRONG.” Hannah counsels JOHN to be strong and assures him that his father will forgive his wrong . In prison, Ikey, deep in the throws of despair and philosophy, sings “MY DEAR YOUR MAJESTY,” a naively hopeful plea for mercy from the King, and a promise to turn his life around if he is released. Act 2 begins when Ikey has disembarked in New York City and is looking for an honest way to earn a living. Finding no work, he sings “LOOKING FOR A JOB,” and decides that, in order to make ends meet for now, he will go back to a life of crime. Meanwhile, back in London, the Bobbies confront Hannah about the whereabouts of her husband. Frustrated by their inability to find the notorious criminal who has shamed them, they arrest Hannah on trumped up charges of theft after planting a stolen watch in her home. Hannah, suddenly aware that she could pay a steep price for her love for Ikey, sings a mournful “STOLEN TIME” as John tries to comfort her, while fearing his own future without mother or father. In New York, a news hawker announces that Ikey’s wife has been arrested and transported to the penal colonies. In a fit of guilt, Ikey sings, condemning himself for having been selfish and vowing to “RISK IT ALL” to go to the colonies and be reunited with his wife and children. Deeply depressed at her current state as a prisoner and worried about the future, Hannah sings the haunting “LOOK AT ME,” bemoaning her fate of servitude and fear. Thanks to the Lieutenant-Governor’s persistence, Ikey is arrested again in his tobacco shop, denied bail, and sent back to England to stand trial. Ikey sings a reprise of “THE BEST I CAN DO,” again expressing his frustration at not being able to succeed in spite of his honest hard work. Ikey is returned to England to stand trial. Outside Old Bailey, the crowds shout for his hanging or freedom. Charles Dickens, a young court reporter and writer of serials, is escorted into the courtroom where he witnesses the trial and writes about it, turning Ikey into Fagin. Ikey is arraigned and convicted on several counts of burglary. Meanwhile, Hannah comes before a magistrate to negotiate her release. As Ikey is convicted and sentenced to 14 years of transportation, Hannah is given her freedom. They sing “NOT GUILTY,” in which each expresses his/her desire to be released from the past. Ikey asks to be returned to Hannah; Hannah renounces Ikey. Ikey arrives back in Van Dieman’s Land in 1831, where he is greeted as a prisoner, not as a hero. Hannah, now a free woman, is preparing to leave with her children for Sydney. While Ikey waits to be processed and shipped out to jail, they meet. He begs her to wait for him, but she tells him she is finished with him and will live life on her own terms. John comes to say goodbye to Ikey before he will also be going to Sydney to start life as a respectable businessman. He hands Ikey a bag of silver as a gift and payment for the tutoring he gave. Ikey, heartbroken, turns to a fellow former thief, Johnny the Dubber, and in a last ditch effort, begs him to pick the locks on his chains. Johnny refuses, citing his own nearing release, and Ikey is left alone to serve his term with the only thing he still has; his belief in doing the best he can do, in spite of the circumstances. The play ends with a musical reprise.